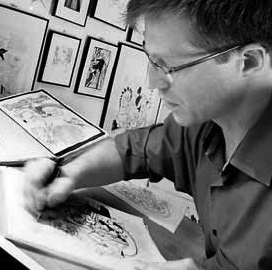 Ulrich Schröder was hired as a Disney character artist when he was 20. He then worked freelance, creating characters and drawing comics for Opel, Nestlé, McCann Erickson, Ogilvy and Mather and many others. After two years, Ulrich returned as Art Director to the European Disney headquarters in Paris. His responsibilities included global book approvals for Disney Publishing Worldwide and Disney Consumer Products in general, creation of Style Guides, supervising creation projects, teaching Disney artists, new Disney staff in general and licensees. During his 18 years at Disney he never quit the drawing board and kept on working as a freelance artist for advertising agencies and publishing houses. Today he is working as a freelance Art Director for different Publication projects and still keeps drawing Comics, Magazine Covers, Children’s Books and creating new character universes.